When we think of “protest music,” it’s often in the most aggressive or direct terms. Rage Against the Machine made protest music. The Clash made protest music. Bob Dylan made protest music. 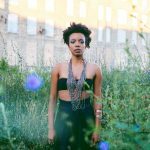 Chicago R&B singer Jamila Woods also makes protest music, but her version takes on a different, often subtler sound. Her music is deeply influenced by a gospel tradition, and though she addresses the ills of our society, she does so playfully and with empathy and love.